Finding the best elliptical machine for the home doesn’t have to be complicated. It’s all about knowing the key differences between ellipticals and knowing what features are most important to you. There are a lot of ellipticals on the market these days, but if you understand how to compare them effectively, you will be able to sift through the junk to find the right elliptical for your home gym in no time. This guide will show you what home ellipticals can offer, which features are most important, and what you should expect from ellipticals in different price ranges. We will finish with an in-depth discussion of the best home ellipticals available today. Ellipticals are a great choice for home fitness. I like to think of ellipticals as a combination between stationary bikes and treadmills. You get the benefits of performing a weight bearing exercise (burning more calories) combined with the low impact motion of a bike. It’s win-win: burn more calories, less stress on the joints. As a physical therapist, this makes me happy. Folks love using ellipticals in the commercials gyms. It’s obvious because at my local YMCA they are always the first thing to fill up. Luckily, ellipticals for the home have gotten pretty advanced. They are a little smaller and a little less heavy duty, but they can offer a lot of the same features the commercial machines offer. And let’s face it, most of us don’t have room for a full sized commercial grade elliptical in our home gyms. Keep in mind commercial grade equipment has to be designed to take the wear and tear of a lot of users day in and day out. The home ellipticals only have to keep up with 1 or 2 users usually. So when looking for a home elliptical, where do we start? Let’s start with the most important features you need to consider before purchasing. You need to find an elliptical that fits your space. If your machine is too large for your space, you aren’t going to be able to use it effectively. Most home ellipticals need a floor space of about 3′ x 6′ to be used comfortably. Keep in mind ceiling height as well. If you are planning on putting it in an attic and you are tall, make sure you will have enough head room at the highest point of the ellipticals motion. Users under 6 ft tall should be fine on any elliptical with an 8 ft ceiling. If over 6 ft tall, add 20 inches to your height and that should be the minimum ceiling height- this is just an estimation, when in doubt, look at the specifications for the machine you are considering. If you think ceiling height is going to be an issue, you should read my elliptical guide for low ceilings. I’m always talking about weight capacity with cardio equipment. It’s just one of those things you have to look at and compare. If I’m stuck between two machines, I always go with the one with the higher weight capacity. It’s a great indicator of quality of build. You have to at least find a machine that comfortably accommodates your weight. Preferably, you should have a 50 lb cushion, but this may not be doable with some of the larger users. I always aim for at least a 300 lb weight capacity. Again, higher is always better in my book. Warranty is another good indicator of quality. Quality machines have better warranties. Junkier machines have weak or no warranties. Always something to consider when purchasing fitness equipment. The 4 factors mentioned above are essential to consider, not just for ellipticals but for any type of fitness equipment. The following features should be considered specifically for ellipticals, starting with the most important. Stride length is the most important consideration when it comes to how comfortable an elliptical is while you are using it. This is what gives an elliptical it’s “feel”, if that makes sense. Technically speaking, it’s how far the pedals move (front to back) during use. Stride length can also be measured while we walk. Having a longer stride length will make it feel more natural, shorter stride lengths will make the motion feel choppy and uncomfortable, especially for taller people. Most ellipticals have stride lengths ranging from 12 – 20+ inches. Nicer ellipticals will be in the 20 inch range because it comfortably fits most people. Anything below 16 inches is probably going to be uncomfortable, unless you are under 5’3″. The flywheel in an elliptical is similar to the flywheel in an exercise bike. It’s what you are pushing against and moving as you use the machine. Flywheels come in different weights and can range anywhere between 13 – 30 lb. Heavier flywheels are typically preferred because they make the ride feel smoother- the extra weight (once you get it moving) builds up momentum and makes the flywheel spin more smoothly. Different elliptical machines offer different levels of adjustable resistance. The nicer, higher quality machines tend to offer more control over resistance. You can expect anywhere from 8 levels of resistance up to 25. Most resistances are controlled magnetically- as the magnetic brake comes closer to the flywheel, it provides more resistance. Magnetic systems are quiet and smooth. Pedals on ellipticals come in all kinds of shapes and sizes. It’s important to find one that feels comfortable during use because this is the biggest point of contact between you and the machine. Pedals should be large enough to comfortably accommodate your foot and allow for some movement as you workout. Nicer pedals have non-slip treading to reduce chance of injury during use. You should know have a good idea of what features you can expect to see discussed when looking at elliptical reviews. As you can see, a lot of the console features are not essential to the operation of the machine. They just make working out a little more interesting. If the extra features aren’t as important to you, you can save some money by finding a machine with fewer bells and whistles. Exerpeutic found away to offer a lot of features in their GOLD 2000XLST elliptical, a lot more than we would expect to see in a machine this affordable. This elliptical not only has a console, it has 21 workouts, a heart rate monitor, and bluetooth. Yes, we are still talking about a budget elliptical here. It’s a little hard to find the specifics with regards to the flywheel weight and stride length on this product. This isn’t that uncommon, a lot of the budget machines don’t go into too much detail with the specs because they’re all pretty comparable in this price range. That said, Exerpeutic states that the 2000XLST ‘s flywheel is “about 2x heavier” than their 1000XL model’s flywheel. According to user review’s, the stride length is 13 inches. Again, not impressive, but common for budget ellipticals. This is a very small stride length and it isn’t going to be very comfortable for taller users. Might work fine for short individuals though. Flywheel and stride length are pretty common for this price range, lets get to the stuff that isn’t common. The 2000XLST offers 21 preset workouts- that’s an impressive amount of workout programs for such an affordable machine. This will give you plenty of workout variety to keep you from getting too bored. This elliptical also has 16 levels of magnetic controlled resistance. Again, this is impressive for an elliptical of this price. Exerpeutic offers bluetooth capabilities in this elliptical as well. This will allow you to monitor and track workout stats using their free workout app. Overall, the Exerpeutic GOLD 2000XLST is a great budget elliptical machine. It’s downfalls are common to all budget ellipticals, but it offers a lot more features than most in it’s price range. Compact says it all, this elliptical is only 41″ long and 26″ wide. This elliptical by EFITMENT would be great for anyone looking for an affordable machine to fit in a small space. Flywheel weight is a mystery, but it has to be very small considering the compact size of this machine. This elliptical’s stride length is 11 inches, so very small. I can tell you right now without question, this machine is not intended for large or tall individuals. The max weight limit is only 220 lb. But if you do fit within the size restrictions, you will be impressed with the features. It’s small size and transport wheels makes it very portable. This comes in handy if you have to move the machine into different rooms of your home. The Compact elliptical is also sporting a magnetic resistance system with 8 different levels. The operation is smooth and quiet, perfect for working out when other family members are sleeping. This elliptical does include a grip heart rate monitor and an LCD display screen that shows calories, heart rate, time, distance, and speed. It’s always nice to see a budget elliptical that includes a heart rate monitor. It comes with large (well, large for this machine) non-slip foot pads. If you are small enough to use this machine, the foot pads should feel fine. Assembly is pretty easy, most users report they can build it in under an hour. The most common complaint is that it is a little wobbly during operation and the bolts have to be tightened up with frequent use. This does not surprise me because this machine has a very small frame and a very low weight capacity. Remember when I mentioned weight capacity is a direct measure of durability? Overall, the Compact Elliptical by EFITMENT is a good choice if you are small and looking for an elliptical to fit in a small space. If you are tall or looking for an elliptical with a long, natural stride length, you would be better off with the Proform 150i. Proform is owned by ICON fitness (the same company that owns Nordictrack), one of the largest manufacturers of ellipticals in the world. Proform offers several different models in different price ranges, but the 150i is their cheapest elliptical. One of the best features the 150i has to offer is a longer stride length, 17 inches. Small stride lengths are a common problem with budget ellipticals. In this price range, the reality is it’s just hard to find an elliptical that is comfortable to use. Well, the Proform 150i is significantly more comfortable because of the 17 in stride length. The 2 prior machines had stride lengths of 13 and 11 inches respectively. Besides having a better stride length, the 150i can also offer 12 levels of resistance and 12 pre-programmed workouts. Pretty good numbers for a budget machine. The 150i does have an LCD display screen that is compatible with fitness apps to track and record workout stats. Fitness apps are incredibly popular these days and it really can make working out more entertaining. I also like that this elliptical comes with a hand grip heart rate monitor. Tracking your heart rate is a great way to monitor your workout intensity and track your progress. Not all machines in this price range can offer heart rate monitoring, but the 150i can. This elliptical has a 250lb weight capacity, not bad but not great. It does have a 5-year warranty on the frame and a 90-day warranty for parts and labor. Again, in this price range, any warranty should be appreciated. The Proform 150i has a lot to offer. It’s a sturdy, durable machine with plenty of features that are normally found on significantly more expensive machines. For the price range, it definitely deserves a spot amongst the best ellipticals on the market. Working our way to the mid-range machines, we should expect higher stride lengths and more advanced features. Both are true for the Schwinn 470. This elliptical offers a 20 in stride length- this elliptical is going to feel more comfortable and natural due to the longer stride length, especially for taller users. The Schwinn 470 has 25 levels of computer controlled resistance and 29 pre-programmed workouts. This machine is going to offer a ton of workout variety to ensure your routines don’t get too stale. This elliptical has 2 LCD display screens for choosing workouts and keeping track of your stats in real time. The console is also bluetooth compatible with multiple workout apps. Another cool feature is that with this elliptical you can connect on RUNSOCIAL where you can “run” different locations around the world while competing with other users in real time. You can also adjust the incline electronically to increase or decrease the intensity of your workout. This is a nice feature we didn’t see on the budget ellipticals. The 470 also offers USB charging, a 3-speed fan, grip heart rate monitor, and a water bottle holder. I mentioned the 20 in stride length, but this elliptical also has a rotation pattern designed to simulate the feel of running. If you are a runner, this is a great elliptical for you because it will feel more like running than a lot of the other machines. Overall the Schwinn 470 is a great mid-range elliptical manufactured by a powerhouse name in the fitness world. The 470 can give you the feel and features of a commercial grade elliptical without the price tag. AFG is part of Johnson Health Tech (JHT), a company that has been making fitness equipment for 30 years. JHT is based out of Taiwan and is the 3rd largest manufacturer of fitness equipment in the world. For those of you unfamiliar with AFG, they produce high quality bikes, treadmills, and ellipticals. They pride themselves in making affordable equipment that can compete with other more expensive machines. The Sport 5.9AE has a 20 in stride length and a 23 lb flywheel. This combination makes for a comfortable, smooth ride even the taller folks will be able to appreciate. This elliptical offers 43 workout programs, 16 levels of resistance, and 20 levels of power incline. This is a ton of workout variety! With that much control over resistance and incline, you will be able to fine tune your workout to accommodate any intensity and any fitness level. This machine will be able to challenge you for years to come and all of the workouts options will keep it interesting. Like most machines in this price range, the 5.9AE is bluetooth compatible with all of the available workout apps. You can also play your favorite music through the 5-watt speaker system installed on the elliptical. AFG also throws in a complimentary chest heart rate monitor, a great bonus. AFG also provides a good warranty: lifetime frame, 3-year parts, 1-year labor. The AFG Sport 5.9AE Elliptical is a sturdy machine that can handle anything you can throw at it. It’s constructed to offer an incredibly smooth ride and it has enough workout variety to keep you working for years without getting bored. This is a fine mid-range elliptical. NordicTrack is another huge name in fitness equipment, well known for producing popular and dependable home fitness machines. The C7.5 is NordicTrack’s most affordable elliptical currently being offered. This machine is rocking a 20 lb flywheel for a smooth and quiet ride. The NordicTrack C7.5 also offers 22 levels of resistance and 26 different pre-programmed workouts. More resistance levels doesn’t always mean more overall resistance, but it does mean you have more control. The more levels you have, the more subtly you can increase or decrease- no huge jumps in difficulty with going up or down a level. 26 is a lot of workouts- you may get to all of them, you may not, but it’s nice to have the option. Exercising on the same machine for years can get a little stale, more variety is always a good thing if you ask me. The C7.5 has an adjustable incline with one touch controls to quickly set up your workout. The one touch systems are awesome, hit a button and you are ready to exercise. This elliptical has a 19 in stride length, a little shorter than the Schwinn and the AFG, but should be long enough to accommodate most users comfortably. The C7.5 has a large 5 in backlit display screen and is iFit compatible (workout app). This elliptical has an impressive weight capacity of 325 lb, so it works well for the larger users. NordicTrack also backs it up with a great warranty: lifetime frame, 2-year parts, and 1-year labor. Overall, the NordicTrack C7.5 elliptical is a good mid-range machine. It has a lot of workouts and offers plenty of control over the resistance. This is a good option for larger individuals because it is a heavy duty machine with a large weight capacity. Sole machines find their way on most “best of” lists, the name is synonymous with high-quality home fitness equipment. The E55 is no exception. This elliptical is easily one of the best home ellipticals on the market. This machines has a 20 lb flywheel and a 20 in stride length. This means a comfortable, smooth, and quiet ride for the user. It also has articulating foot pedals that rotate for added comfort during use. This elliptical offers 10 different pre-programmed workouts. This number might be a little lower than expected, I agree. I would like to see that number a little higher, however this machine does offer 20 levels of power incline. With 10 workouts and 20 levels of incline, you should be able to find enough variety to keep you interested. The E55 has a 9 in display screen. This is significantly larger than anything we’ve seen thus far. Of course it’s bluetooth compatible and has the other common features such as cooling fan, speakers, and water bottle holder. You can tell we are in an upgraded price range because the max weight capacity on the E55 is 375 lb. This is significantly higher than the machines discussed earlier. This is because the E55 is more heavy duty, more sturdy. This machine more closely relates to a commercial grade elliptical, that is, something you might see at your local gym. The warranty is pretty good: lifetime frame, 5-year electronics and parts, 2-year labor. In this price range, you will see better warranties and worse. The Sole E55 is a great introduction to the high-end ellipticals. It’s a quality machine that is built to last. It’s sturdy enough to handle the hardest workout you can throw at while keeping you comfortable at the same time. Precor invented the elliptical in the 1990’s and has been producing top of the line machines ever since. Precor manufactures ellipticals designed for home use and commercial use. The EFX 225 is basically a commercial grade elliptical marketed for home use. If you are looking for the feel of the elliptical you have used at the gym, this is it. Precor doesn’t list the stride length for this machine, but it does have a power adjustable incline (Crossramp technology) with 8 different settings. This is a great way to change the feel of your workout and target different parts of your leg- quads, glutes, or calves for example. Some of my favorite ellipticals at Gold’s (when I used to have time to workout at a local gym) used this technology and I really liked it. If you are really interested in finding an elliptical with great incline options, see my elliptical power incline guide. The EFX also offers 10 pre-programmed workouts and 16 levels of adjustable resistance. Again, these numbers are a little lower then some of the more affordable machines out there, but with the Crossramp adjustments you will be able to add a lot of variety to your workout. This elliptical really doesn’t have a lot of fancy features to offer. It does have a tablet holder and you can control the volume of your connect smart phone through the console, but that’s the extend of it’s smart features. If you are looking for more advanced bluetooth technology or fitness tracking, you may want to consider other machines. The EFX 225 has a nice warranty: lifetime frame, 5-year parts, 3-year console, 1-year labor. It’s hard to find a stated weight capacity on this machine, the website report it has been tested up to 275 lb. Considering the build of this machine, I would expect it can handle more than that. If you are looking for the feel of a commercial grade elliptical, you should consider the Precor EFX 225. Precor invented the elliptical and has perfected both home and commercial grade models. The EFX 225 is truly one of the finest home ellipticals on the market. Life Fitness is a well known manufacturer of commercial grade fitness equipment. Odds are, if you’ve ever used an elliptical at your local gym, you’ve used a Life Fitness machine. Well, lucky for us home gymers, Life Fitness also produces products for the home. A little known fact, Life Fitness actually created the first electronic stationary bike (according to Wikipedia). The E1 is Life Fitness’s most affordable home elliptical. This machine comes with a 20 in stride length- perfect for recreating that club machine feel. If you are looking for a machine that has the same feel as a club elliptical, you definitely want to go with a 20 in stride length. That stride length has also been shown to comfortably fit most users regardless of height. Life Fitness also does a lot of research to create the most fluid and natural motion during use. The E1 elliptical takes advantage of their “WhisperStride” technology to create one of the most quiet ellipticals on the market. This technology incorporates the use of maintenance-free ball bearings to provide an ultra quiet motion. For those of us working out early in the morning, this is key to making sure we don’t wake up angry kids and spouses. This model comes with the “Go” console which offers 20 levels of resistance and 12 preprogrammed workouts. It also has one touch keys to instantly start a quick workout without having to fumble over several options. These are great if you know exactly what you want to do and don’t wanna waste any time setting up options. The E1 has an impressive 400 lb max weight capacity (I told ya this machine has the feel of a club unit). It also boasts a pretty impressive warranty: lifetime frame, 5-year parts, 3-year console, 1-year labor. I almost forgot, the E1 has grip heart rate sensors of course, but it also comes with a chest strap heart rate monitor! A nice touch by Life Fitness. The Life Fitness E1 elliptical is the closest thing you can find to a commercial grade machine without paying the commercial prices. It’s quiet, smooth, and durable enough to last through the hardest workouts you can throw at it. Keep in mind that all this durability means that this is a heavy machine. Users report that assembly is actually pretty easy, but once this thing is assembled, it’s difficult to move (it weighs about 200 lb). If you are bummed about the lack of bluetooth compatibility, don’t fret. You can also get the E1 with the Track Connect Console which offers bluetooth connectivity to fitness apps and a few more workout options. User reviews are incredibly positive. Currently, it’s boasting a perfect score on Amazon, 5/5 by users. You should now feel confident in your ability to pick the best elliptical for YOUR home. You know you need to consider certain factors, including: machine size, weight capacity, warranty, and price. These are the essentials and should directly guide your buying decision. Also important are considerations like stride length, workout options, resistance levels, and console features. These might not be as essential as the 4 above factors, but these characteristics are going to be what dictates how comfortable and how fun your new elliptical will be to use. After all, the best elliptical in the world is worthless if you don’t want to use it. 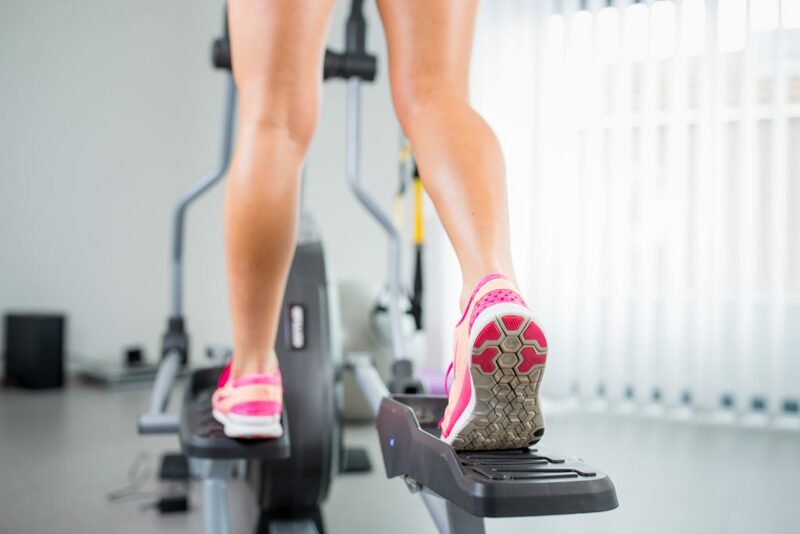 Speaking of comfort, keep in mind stride length is the most important aspect to consider when it comes to how comfortable an elliptical is to use. Longer stride lengths are usually preferred, but it does depend a lot on your height. Now that you’ve seen the best ellipticals for the home, there’s only one more thing to do… find the one that best matches your needs and start using it! I hope this article was helpful. As always, if you have an questions or comments, leave them below and I’ll get back to you.